Cougle Commission Company is fully committed to the safety of our products. As a testament to our commitment to food safety, we provide letters of guarantee and quality assurance to each of our customers. Within those letters, we vow to provide wholesome products that are produced in accordance with all applicable Federal rules and regulations governing sanitary and safe food supply. Not only do we provide these letters, we actually follow through on our guarantees, as evidenced in the safe product we distribute each and every day. As a federally-inspected plant, inspectors from the USDA's Food Safety and Inspection Service inspect our plant and processing rooms on a daily basis. We work with these monitors to make sure that only safe and wholesome products leave our facility. 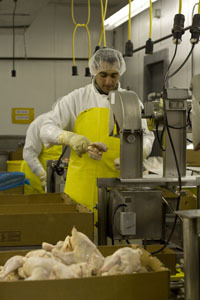 Our Good Manufacturing Practices (GMP) Program and Hazard Analysis and Critical Control Point (HACCP) Plan reinforce this notion of food safety, and all of our employees receive comprehensive GMP and HACCP training annually, even those employees who do not set foot on the processing room floor. 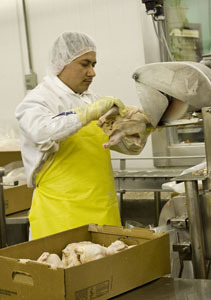 Food safety is not limited to our processing room employees. It is an awareness that permeates our entire company. We only source our product from the finest poultry suppliers. In order to become an approved supplier of Cougle Commission Company, our suppliers must provide a litany of information to us, as we want to make sure that the product we bring into our plant is just as safe and wholesome as the product that we send out to our customers. To the extent we can, Cougle management will even make site visits to new suppliers to check on their operation. Cougle takes food safety seriously, and we expect no less from our suppliers. We are extremely proud of our food safety record here at Cougle, and we strive to improve upon this record every day. © Copyright 2019. Cougle Commission Company. All rights reserved.